Its so funny looking back now, today we have mobile phones and the internet, when I was away it was very expensive to ring home. To keep in touch I would have to write a letter to my parents, I would wait two weeks and a letter would come back. I used to get so excited to hear back from home, and if it was a special occasion I would get a phone call. 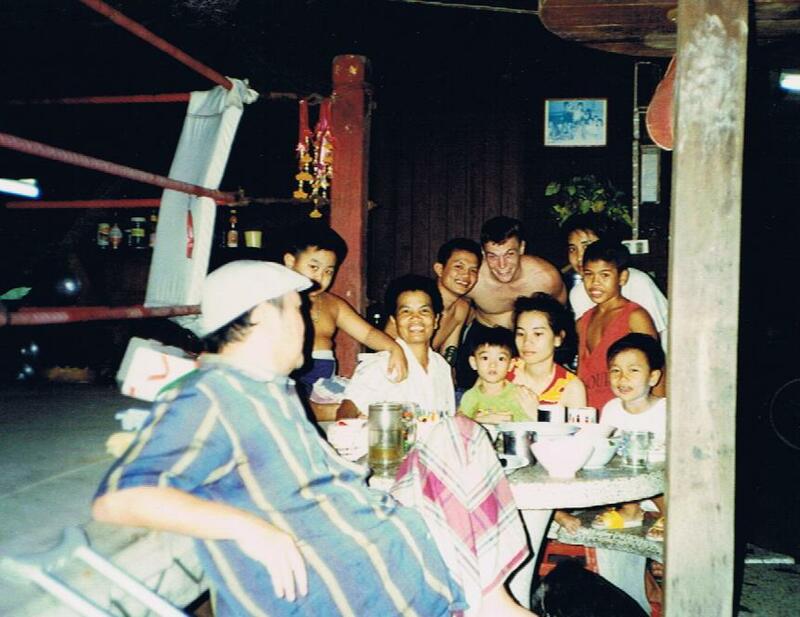 When I turned 21 I always thought I would have the biggest party and be legless for a week, ended up I had a fight a week after my birthday and had to train, my Mum rang to say happy birthday and the Thai’s bought me a cup cake and put a candle in it, oh yeah, living the dream. 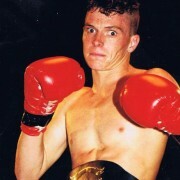 This photo was after my 6th fight, I just won my first ever belt at 17 at super light weight. All I ever dreamed of was winning a belt and now I had one around my waist. I have no idea what is going on with my eyes, I think when you look scary and crazy it suppose to mean you’re happy ha ha. 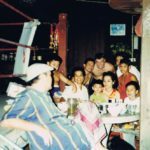 When I first got to Thailand I stayed in a place called Pattaya, it is famous for their lady boys. I was very lucky I was told by one of my friends that you have to listen to a lady boy talk, then you know straight away if it’s a girl or a boy. Soon as this young lady started talking I knew straight away it wasn’t a lady. 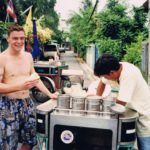 Here is some of the cuisine that they have on offer in Thailand, the beauty about Thailand is everything comes to you, your groceries come in the back of a ute, snacks, flowers, everything. Every seller has a different noise or bell so you can tell who is who. Here are two of my favourites, first one was the lunch time special noodles, I would wake up in between training sessions and get one of these everyday to make sure I had enough energy for afternoon session. It was only 10 baht and sooo good. 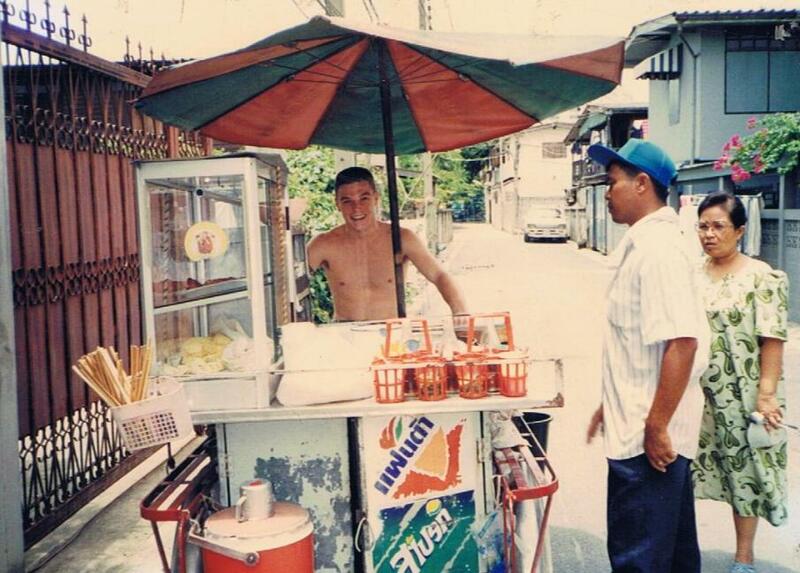 The next was a dessert, its a bread roll with sweet sticky rice in the middle with ice cream on top, I would never in my life would of thought this would taste good but I ended up addicted and would get one every morning after training. 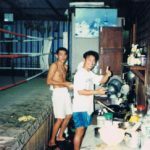 Since we are on food, here is a little pic of the kitchen at Loomingkwan, all the food was made here with the ring becoming a bench top after we stopped sweating in it. Looks weird but in Thailand everything makes sense. As I was saying Loomingkwan was such a small gym and we were so tight birthdays for everyone was a big deal. After spending day in and out together I really began to feel like family. Here is a pic of us with one of the kids getting ready to blow out his cake. 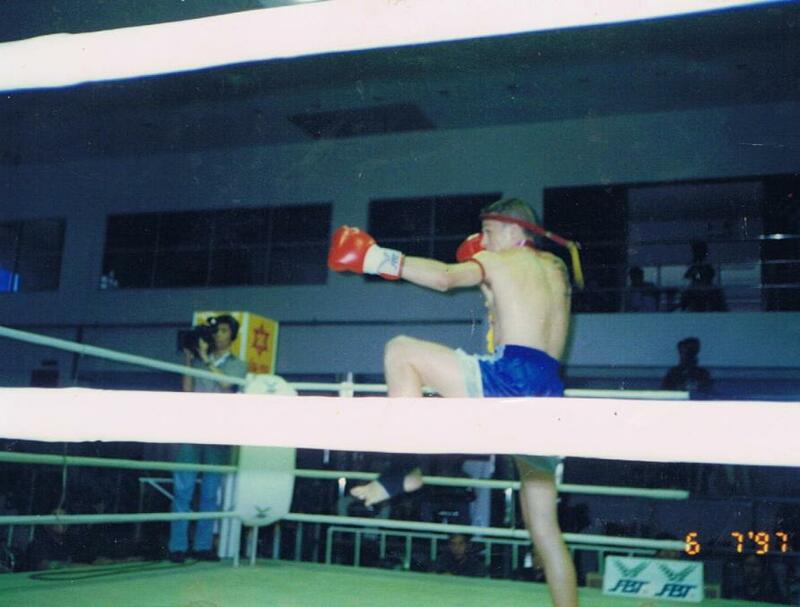 The early days fighting for the camp I had three fights in a stadium called Bungyai, there was no westerners there and just having a white guy there would have everyone stop and stare, when they knew you were fighting then it really become a big deal to see if you could hang with the Thai fighters or get knocked out in the first round. I ended up three from three there so happy I didn’t get laughed at by the locals. Check out the change room, concrete floor and sheets of iron to make a wall. 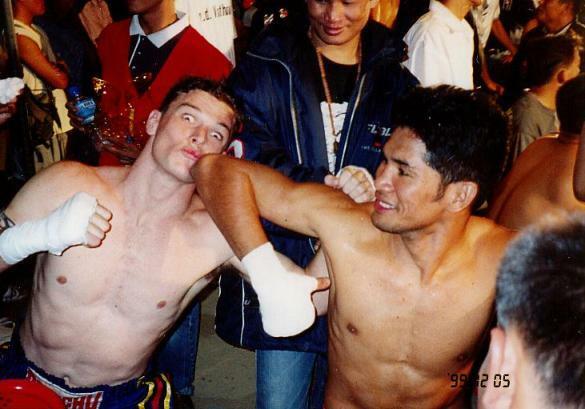 Back then I didn’t care though, just to be fighting was all I cared about. 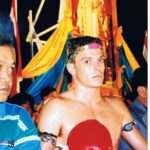 Working with a legend like Sangtien was pretty amazing, I had heard of the stories of the Deadly kisser but to be training with him was crazy, when it was just us and the pad holders man did I have to lift my game everyday so I didn’t get rag dolled in the grapple and beat up play sparring. 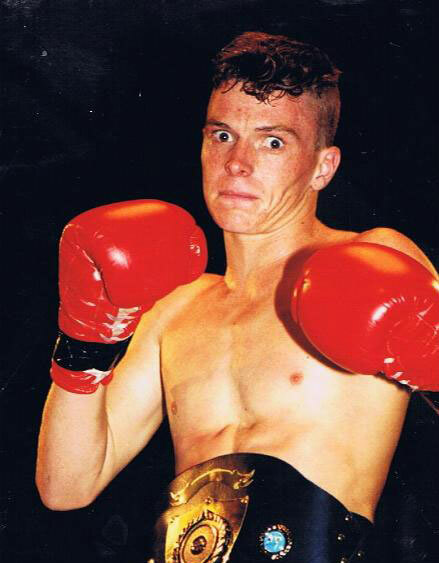 When we sparred boxing we would wear 18oz gloves, if I was only going 80% Sangtien would stop half way through a round and yell me “you either spar me 100% or don’t waste my time”. So much love in the camp back in them days ha ha. 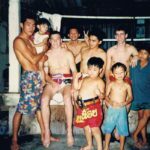 When I was going to have my first fight at Lumpinee, me and my best mate Bik, who was Por’s youngest son and my age decided to make up a new ram muay. 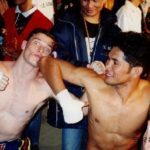 We were thinking of everything we could to try and come up with a cowboy ram muay, after joking around with stupid ideas for half a hour we finally thought about shooting the guns. 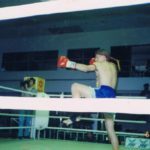 When I pulled it off everyone at Lumpinee gave me a massive cheer, it was on Thai tv and it helped me stand out from the rest of the westerners that had fought in Thailand before. 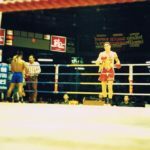 When I did it in front of my opponents the first few times they would look at me like WTF is he doing, then they would really want to beat me up after that. Here is a bit of Thai culture for us that I had no idea about, ghost live in tree’s, when you cut a tree down and make a house out of it the ghost comes with it. Everyone in my camp believed the post in my room had a spirit in it and they would decorate it, add perfume to make it smell nice and bring flowers out of respect. 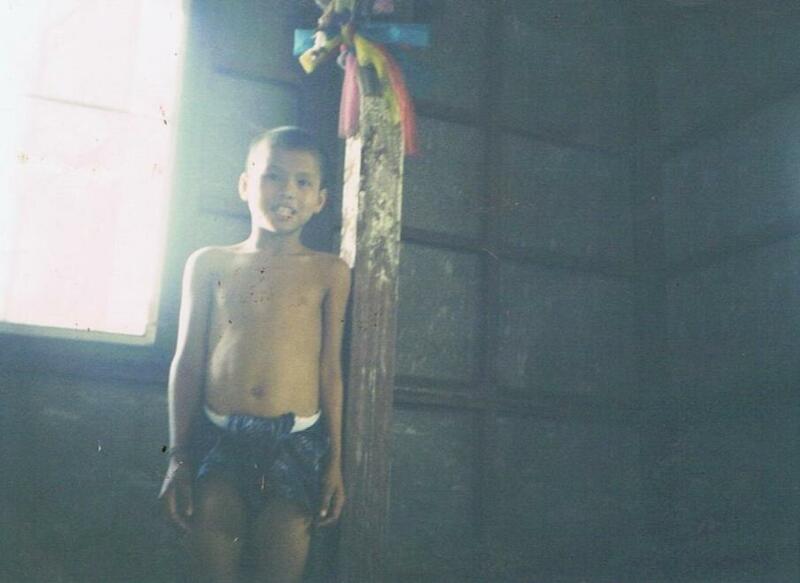 My first night I got to the camp I had no idea, i picked my place on the wooden floor to sleep in front of the pole. 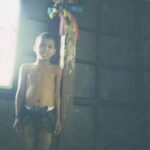 At night we were having a chat with the boys and silly me put my feet on the pole, the whole room went silent, then one of the boys dived across the room and got my leg off the pole. They quickly went down stairs to get Por’s oldest son so he could explain in English about the ghost and that I never do that again. I won’t go into it too much but i seen lots of ghost in my dreams after that during my stay in that room and held down in my sleep 100’s of times, very scary but either that or sleep outside? Another way of keeping the gods happy is offering food. When Sangtien opened his own camp we had a big day with monks blessing the ring and also food offering for the ghost house. 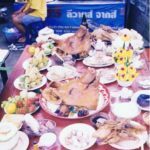 Instead of buying whole pigs, the Thai’s buy the head, the hoofs, and the tail to represent the full body of the piggy. 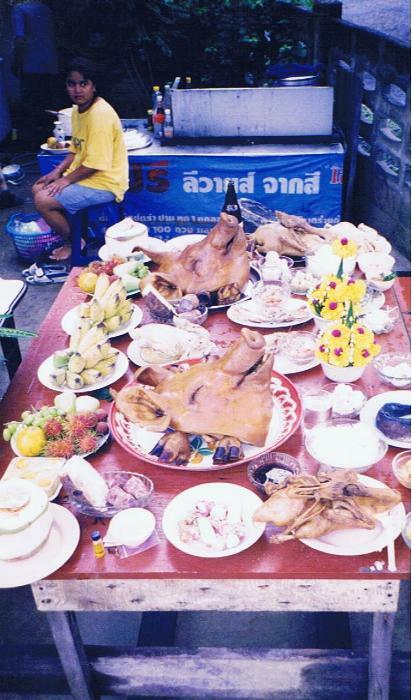 After the ceremony the Thai’s boil the head and make a soup. Think that sounds gross, yep it is! Kings birthdays are the most crazy nights ever, not only are you fighting in front of 100,000 people in a park but the change room is complete chaos. There is a fighter’s tent you get ready in on a dirt floor, then there is a tiny piece of string going around the tent, this is to keep out the fans from coming in as you prepare. Now you have about 50 peo ple in this tent, there in 10 to 15 people deep surrounding the tent at all times and its about 35 degree’s, with all those people standing there though it feels like 50 degrees. 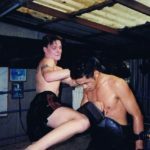 After you get your Thai oil massage you try and shadow box but the dirt sticks to you like glue and you have to practice your kicks in sandals. 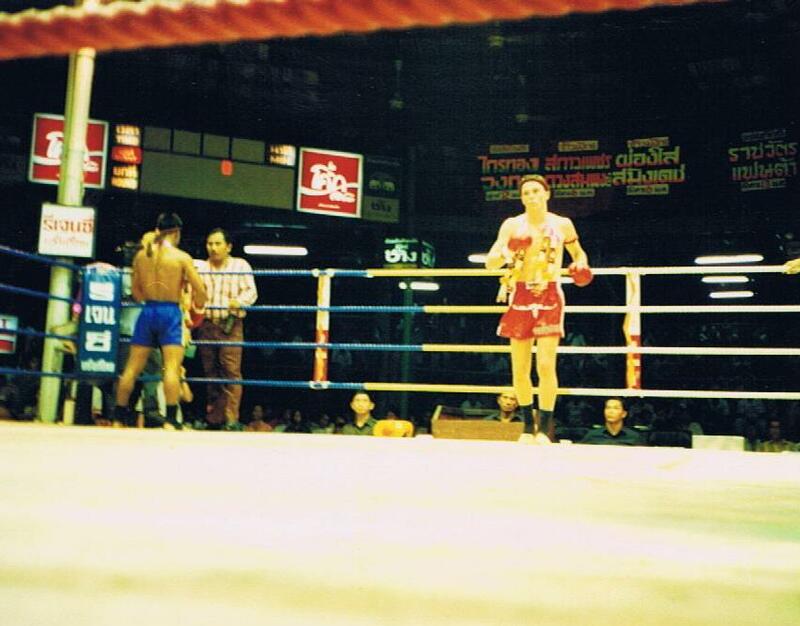 You are only about 5 meters away from your opponent in the same tent so little bit of tension before you walk out. All good but, wouldn’t be Kings Birthday if it wasn’t the craziest night of the year. I got a photo of me and Rexy in my pile of photos somewhere. 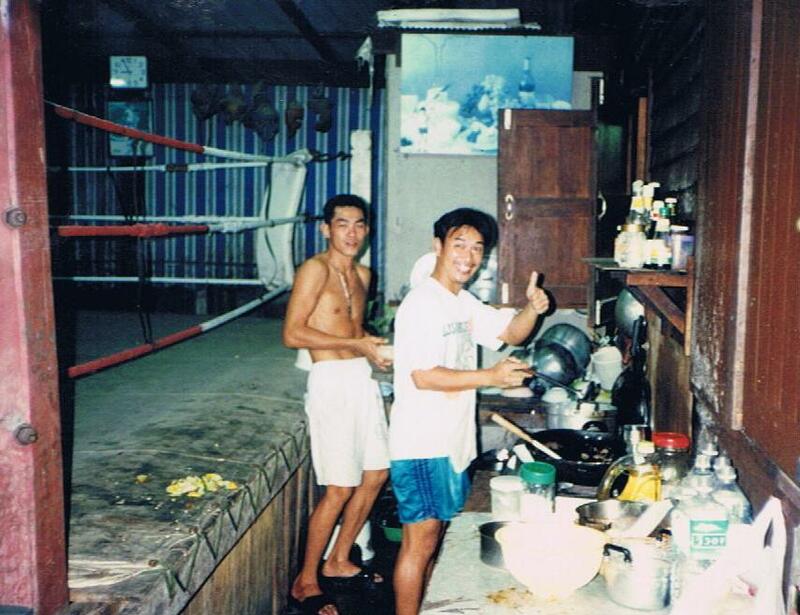 When I had time off between fights there was a good chance I was drunk somewhere. 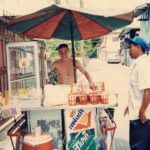 I think almost every Thai has a drinking problem and it didn’t take long to work out why. One day me and our mates went on a drinking adventure out in the country. 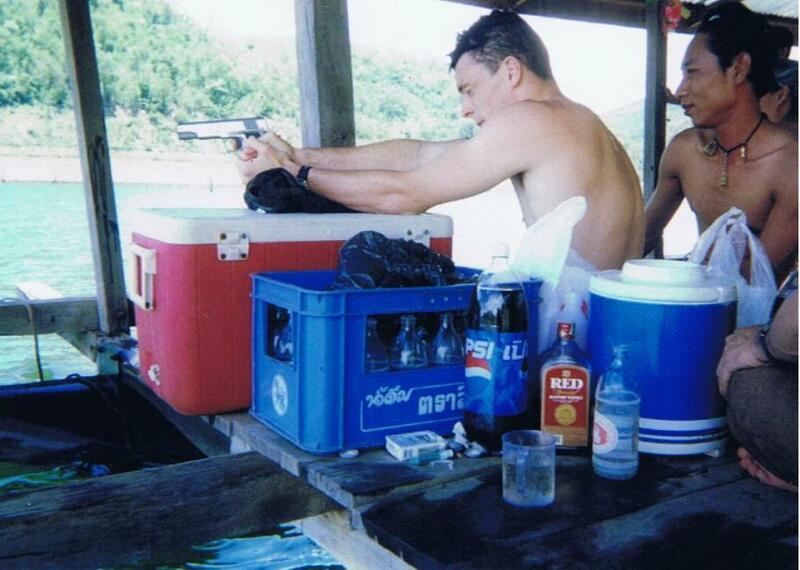 One of our friends was a police officer, all Thai’s like to carry guns as well. We drank all night and into the day. Someone had a good idea we get the guns out and practice shooting targets, the policeman handed me my gun and said go for it, was so much fun but so wrong at the same time. 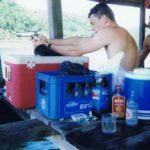 Once again everything in Thailand made sense, it was best not to think about it and go with what everyone else was doing. Thats another 5 minutes of your life I have wasted. Hope you enjoyed that as much as the other 2 threads and not getting bored with my “once upon a time” stories. 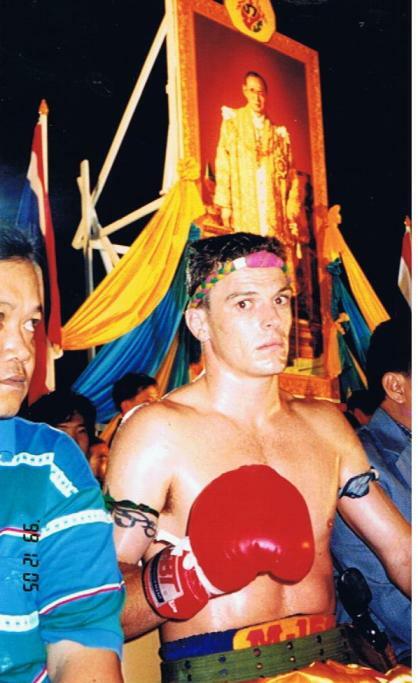 i Love reading about ur time in thailand wayne, u should write a book one day. Great story! 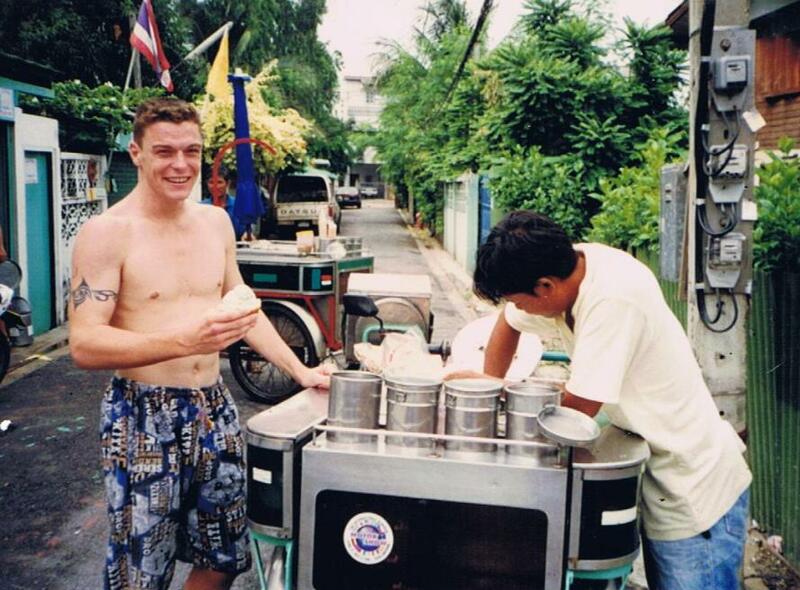 I left Ireland in ’04 for Australia but never made it, got stuck in Asia for 14 years…..so far. Have just taken up Kickboxing and came across JWP. Wish I’d gotten into this years ago.